Sunflower seeds have become a popular snack food. The sunflower plant is an annual herb that has large yellow flowers, broad leaves and can grow from 3-15 ft (0.91-4.6 m) high. To make the finished product enjoyed by millions annually, the seeds are harvested after about 120 days, dried, roasted, salted and packaged. The sunflower plant originated in western North America. It is thought to have been domesticated around 1000 B.C. by Native Americans. Spanish explorers brought the sunflower to Europe in 1510. However, it was not until the late 1800s when the flower was introduced to Russia that the sunflower became a food crop. In 1860, Russian farmers made significant improvements in the way that the sunflower was cultivated. During this time, they became the world's largest producer of sunflower seeds. Today, they remain a world leader along with Europe, Argentina, and the United States. Production in the United States has emphasized oil producing varieties, but snack food producing sunflowers have steadily increased. Sunflowers are technically classified as Helianthus annuus. They are a large plant and are grown throughout the world because of their relatively short growing season. In the United States, some varieties reach maturity from 90-100 days after planting. Domesticated sunflowers typically have a single stalk topped by a large flower. This is significantly different from the smaller, multiply branched wild sunflower. Sunflowers have large yellow, ray flower petals on the outer edge that do not produce seeds. The sunflower head is composed of 1,000-2,000 tiny little flowers joined together at the base. These flowers are disk-shaped and can be brown, yellow or purple. During the growing season, the individual flowers are each pollinated. Seed development then begins moving from the outer rim of the flower toward the center. It generally takes 30 days after the last flower is pollinated for the plant to mature. The sunflower plants reach various heights, but most are from 5-7 ft (1.52-2.1 m) tall. The width of the flower heads is relatively large, typically between 3-6 in (7.62-15.24 cm), although some can reach more than a foot. An exception is the dwarf varieties that are only 3-4 ft (0.91-1.22 m) high and have smaller flower heads. A common characteristic of sunflowers is a tendency for their flowering heads to follow the movement of the sun during the day. This phenomenon, called heliotropism, has the benefit of reducing bird damage and disease development. Most sunflower plants grown in the United States are used for the oil production. The plants have been bred over time and have steadily improved in quality and consistency. Many options are now available including dwarf varieties and high oil types. Certain hybrids have higher yields and a reduced oil content. The modern sunflower crop is self pollinating so insect vectors are not necessary. Other traits of the crops that have been controlled are disease resistance, speed of maturity, and seed size. While most sunflower seeds are used for their oil, sunflower seeds are also sold as a food product. These products are available in many different flavors. Most are sold salted and in their shell. They can be coated and sold as barbeque, sour cream, or ranch. Certain varieties of sunflower seed are made unsalted or with reduced sodium and fat for more health conscious consumers. For smaller sunflower seeds, the shells are removed and only the kernel is sold. These variants are generally easier to eat. Seeds are packaged in plastic bags or glass jars, which are also available in various sizes. The seed is the primary ingredient in all sunflower seed products. They are four sided and flat. They are generally a quarter inch long and an eighth of an inch wide. They have a black seed coat with dark or grey stripes. The coat, or hull, surrounds a small kernel which is composed of about 20% protein and 30% lipids. Additionally, it contains a high level of iron and dietary fiber. The high linoleic acid content of the kernel makes it prone to rancidity and thus gives it a limited shelf life. While plain sunflower seeds are sold as a snack food, most varieties are soaked or coated with ingredients to improve the seed's characteristics. Flavor enhancers are often added to increase appeal and differentiate product types. Salt is the most common flavor enhancer. It can provide a subtle taste effect that removes the "off flavor inherent in raw sunflower seeds. A small amount of sugar or dry corn syrup can be added to impart a sweet flavor. Spices and herbs such as garlic, onion powder, or paprika can also have a unique effect on how a sunflower seed tastes. Both natural and artificial flavors can be included. Beyond flavoring ingredients, manufacturers include texture and appearance modifiers, antioxidants and preservatives with sunflower seed recipes. Texture modifiers such as maltodextrin or cornstarch help control the feel of the sunflowers when they are put in the mouth. Color modifiers are used to change the seed's appearance. Typically, natural coloring materials are used. These modifiers are useful for sunflower flavors such as barbeque or sour cream. Antioxidants are sometimes added to improve the sunflower seed's shelf life by inhibiting natural rancidity reactions. Salt has the added benefit of also preserving the seeds. To grow the best sunflower plants, the soil must be adequately treated. Sunflower growth is dependant on the amount of nitrogen available more than any other nutrient. For this reason, about 100 lb (45.4 kg) of nitrogen fertilizer per acre is used. Phosphorous and potassium are also included in the fertilizer. To protect the crop from damage, herbicides are added to the soil. Insecticides are also used, but only to a limited extent to prevent the killing of beneficial pollinating insects. 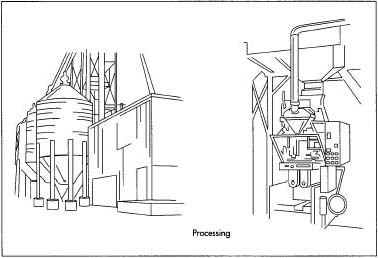 Producing sunflower seeds involves the basic process of growing and harvesting the plants, separating the seeds, roasting them and then packaging. 1 Sunflower seed production begins in early spring when the fields are prepared and the seeds are planted. The seedbeds are tilled and the soil is kept moist. Having adequate moisture content in the soil is the most important planting requirement. The seeding rate (number of seeds planted per acre) is particularly important for sunflower seeds sold as snack foods because a high seeding rate results in smaller seeds which are less desirable. Roughly 17,000 seeds are planted per acre for snack food sunflower seeds. Row spacing is typically between 20-30 in (50.8-76.2 cm). It is thought that the best orientation of the plants is in a North-South direction. 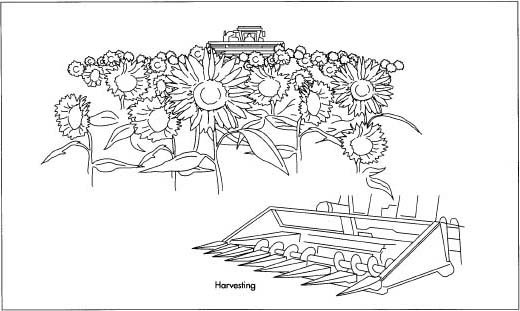 A common planting method is to use a corn planter fitted with a special sunflower seed plate. The seeds are typically treated with a fungicide prior to planting. Sunflowers are harvested in the United States in late September or October. A modified grain head is put on the front of the harvesting combine to reduce seed loss. This special device collects the sunflower heads, while minimizing the amount of stem material. while minimizing the amount of stem material. Harvesting speed is reduced to prevent dehulling of the seeds. 3 The seeds are rapidly dried to under 10% moisture content. Growers typically have facilities on their farms to store seeds until they can be transferred to the local grain elevators. From here, the seeds are transported by truck or train to the processing sites. 4 When the sunflower seeds arrive at the processing plant, they are emptied onto wire screens and shaken to remove dirt and unwanted debris. They are also inspected to ensure they meet previously determined specifications. Factors such as moisture content, appearance and taste are used to evaluate the shipment. They are next transferred to a large bin and further cleaned. 5 The seeds are then passed on to sizing screens which separate them by size. These screens have holes that allow smaller sized seeds to fall through. The largest seeds will be further processed as snack foods. Medium sized seeds are destined for use in toppings for cookies, salad, or ice cream. The smallest seeds are sold as bird and pet feed. 6 Snack food sunflower seeds are transferred through large ovens. Here, they are dry roasted, reducing the moisture level in the seed further. The medium sized seeds are first sent through de-hulling machines which remove their shells. They are then roasted in oil. 7 Both types of seeds can be flavored as desired. There are a variety of ways in which this can be accomplished. In one procedure, the warm seeds are transferred out of the roasters and put into a large, rotating container. As they are moved around, they are combined with the flavoring ingredients. Oils are sometimes used to make the ingredients stick better. When the sunflower seeds arrive at the processing plant, they are cleaned and inspected Next, the seeds are passed on to sizing screens that separate them by size. These screens hove holes that allow smaller sized seeds to fall through. The largest seeds will be further processed as snack foods. Medium sized seeds are destined for use in toppings for cookies, salad, or ice cream. The smallest seeds are sold as bird and pet feed. Snack food sunflower seeds are dry roasted, reducing the moisture level in the seed further. The medium sized seeds are hulled and then roasted in oil. Once flavored, the seeds are packaged in air tight containers to prevent spoilage. sealed plastic bags. It is important that this packaging be air tight to prevent the uptake of moisture by the product because moisture can cause them to become rancid. From the packaging station, the sunflower seeds are transferred to boxes, put on pallets, and shipped to stores. To ensure that a consistent and quality product is made, sunflower seeds are examined during each step of production. While the plants are growing, they are frequently checked to make sure they are growing properly and free from disease. The seeds are also inspected when they are received at the manufacturing plant. They are subjected to a variety of laboratory tests to ensure that only high quality seeds are used. The finished products are also tested. This may include a chemical analysis or a consumer taste test. Packaging components may also be inspected. The hulls are the primary byproduct of sunflower seed production. This material is high in fiber and is often used as a feed additive for cows. The hulls have also been sold as poultry litter, fireplace logs and fillers for plastics. These markets have been limited and the hulls are often just burned by the factories for energy. Current sunflower research promises to produce improved crops. These plants will be designed to produce a greater yield per acre, grow faster, be better tasting, and more tolerant to pests and diseases. Marketers will also develop new recipes with flavors designed to attract more customers. Booth, Gordon. Snack Food. New York: Van Nostrand Reinhold Co., 1990. Hoseney, Carl. Principles of Cereal Science and Technology. St. Paul, MN: American Association of Cereal Chemists, 1994. Macrae, R. et al., ed. Encyclopedia of Food Science, Food Technology, and Nutrition. San Diego: Academic Press, 1993. Salunkhe, D.K., J. Chavan, R. Adsule, and S. Kadam. World Oilseeds-Chemistry, Technology and Utilization. New York: Van Nostrand Reinhold Co., 1992.